The week has largely been dominated by shearwaters and seals so not surprisingly they are the topics of discussion! 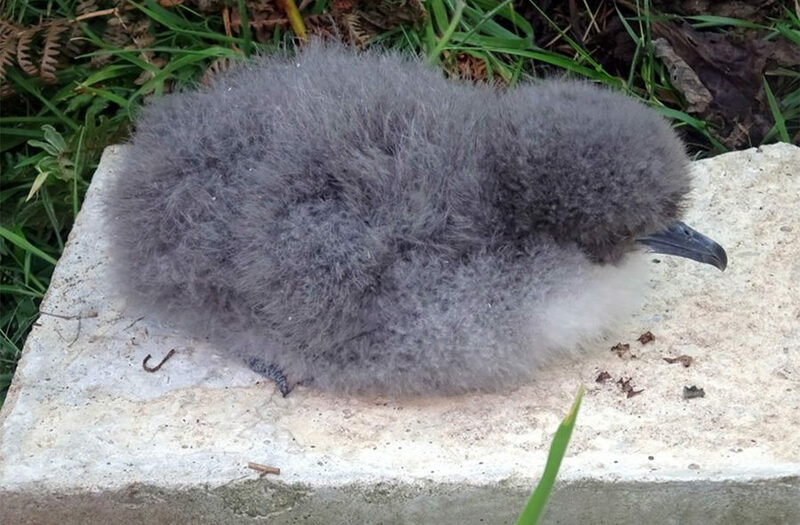 Shearwater fledglings: The new moon phase falling over peak Manx shearwater fledging time was good news for us as it meant lots of birds venturing to the surface for us to catch and ring. With invaluable additional help on the ringing front this year from Scarlett Hutchin (former Ramsey volunteer and VoD crew member) we have ringed more than any other year. We are closing in on 300 in our small study plot on the NE coast (as of last night we are on 278 so should pass 300 tonight or tomorrow). We have now ringed over 1200 fledglings since we started the project in 2010 and have logged more ‘re-traps’ this year than ever (i.e. birds ringed here as fledglings in previous year). Most are second year birds and this will be the first time they have touched land since leaving Ramsey, having been to Argentina and back twice in that period. Remarkably we have been picking these birds up on the surface within 100m of the burrow they were born in! We have also picked up a few 4 year old birds too which are on the verge of breeding – one of these was found in a nest box with an un-ringed partner giving hope for an addition to our study population next year. The two nest box chicks continue to do well and should hopefully fledge in the next 2 weeks – not bad for first time parents! Grey seals on the move: The breeding season is ramping up now with 68 pups on the 9 study beaches during yesterday’s census (29 of which were on Aber Mawr alone, reinforcing how important this site has become over the years). A cow that pupped on Aber Mawr this week is known to us from our photo recognition scheme. She pupped at The Wick on Skomer from 2007-12 but since 2013 has pupped on Ramsey, either at Garlic or Aber Mawr. Hogging the limelight: Our first pup of 2016 was born in the harbour last night. Pupping on the beach here is a recent phenomenon and is likely the result of competition for space at the traditional pupping beaches. Not only do these pups have to put up visitors cooing over them all day but the beach here is tidal, so they are forced to swim for several hours on each high tide. Not ideal but with a good mum and decent weather they have a fighting chance.